Anti-poverty campaigners warn emergency funds loaned to Haiti, at the height of crisis, will become a heavy debt burden for the quake devastated country. Already caught in a cycle of repayment for loans racked up by dictators from the western governments that kept the country’s looters in power, Haiti can’t afford its future in the present form of help. Haiti is sleepwalking towards a debt crisis because international help for the earthquake-hit country is being given in the form of new loans, anti-poverty campaigners are warning. Donors are agreed that the immediate priority is to get aid to Haiti’s stricken capital of Port-au-Prince, where relief co-ordinators warned this weekend that supplies of food are still woefully short, and where the threat of violence and disease is increasing by the day. But in a new study, Unctad urged the international community not to forget that emergency funds lent to poor states at the height of a crisis can become a heavy burden for years afterwards. Unctad’s researchers analysed the impact of 21 natural disasters – between 1980 and 2008 – on poor countries that were heavily in debt. They found that meeting the costs of rebuilding leaves long-term financial scars: on average, a natural disaster leads to a 24 percentage-point increase in a country’s debt-to-GDP ratio, a widely-used measure of indebtedness. “Shocks on such a scale can lead to a vicious cycle of economic distress, more external borrowing, burdensome debt servicing, and insufficient investment to mitigate future shocks,” it said. With pressing humanitarian needs on the ground, the International Monetary Fund last week agreed $102m (£62.9m) in new lending to help provide emergency assistance and rebuild Haiti’s shattered infrastructure. 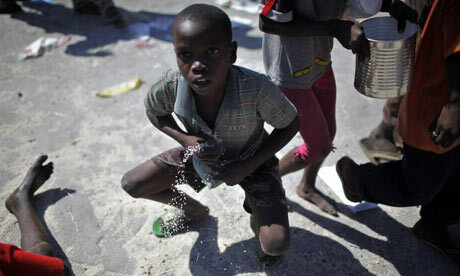 Charities point out that this will bring Haiti’s total debts close to the unmanageable $1.3bn level hit in 2005, when it qualified for debt relief from the international community as a “heavily-indebted poor country”. “Much of this money was lent at a time when Haiti had massive, odious debts,” said Nick Dearden, director of Jubilee Debt Campaign. Dominique Strauss-Kahn, the IMF’s managing director, has made clear that in future he would like to see all the Fund’s lending to Haiti cancelled. However, there has so far been no agreement among member states. Haiti is not due to make any repayments to the IMF for two years, and there are fears that political momentum for debt forgiveness will have drained away by then. “What we’re worried about is that once the spotlight is off, it will be forgotten,” said Dearden. Before it was granted debt relief, Haiti was spending about $50m on repaying its creditors, with much of the debt having been contracted years ago. The UN is assessing the scale of Haiti’s financial needs in advance of a major donor conference to be held in New York in March — potentially a forum for debt relief plans to be formally discussed. Britain backs the IMF’s view that the priority is to get cash to survivors, shelving the question of debt relief for later. Haiti’s largest creditor is the Inter-American Development Bank, which said it would like to see a new debt relief programme, but, like the IMF, has so far made no concrete proposals. Charities are also concerned about the growing role of the IMF in the world’s poorest countries, because its assistance tends to be in the form of concessional loans, rather than grants, and often comes with conditions attached.